Snelling used vintage pulp fiction novels as the conceptual jumping off point for her poster designs. 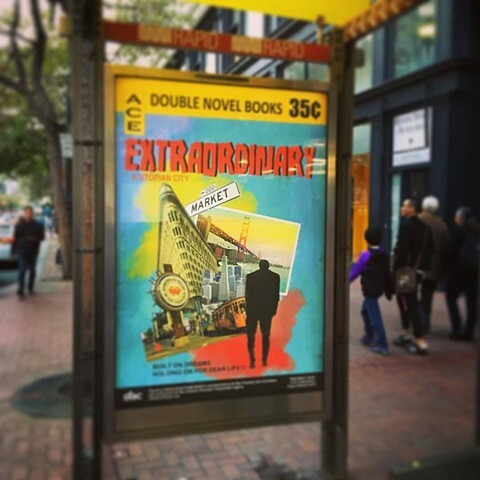 The posters are titled HEROIC, DARING, EXTRAORDINARY, MYSTERIOUS, RADICAL, and TRANSCENDENT, qualities the artist believes encapsulates San Francisco and its residents. To create each poster, the artist layered two-dimensional images with images of her highly realistic three-dimensional sculptures, for which she has garnered international acclaim. Photographs of sunsets, cityscapes, night skies or large expanses of brushed color comprise the backdrop for her dynamic and striking collages. The end result is a poster series that combines the real and the surreal with a heavy dose of nostalgia.